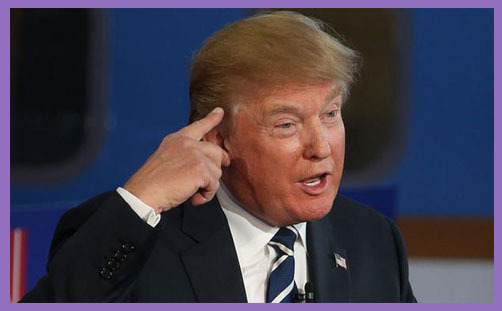 Say what you will, write as you want, think what you like, but Donald Trump is on the demotic ascendant and is currently in pole position to win the GOP nomination to become their candidate for President of the United States of America in 2016. He has – how shall we put it – a few robust views on certain contentious issues, and (lest the enlightened liberal-democratic progressives forget) he has a considerable following (and his views considerable support) among the people. If Jeremy Corbyn’s leadership of the Labour Party is morally validated and politically sustained by affirmative democracy over demagogic plutocracy, then Donald Trump’s popularity renders his dominion equally meritorious. In response to the San Bernardino “act of terrorism” (so called because it was carried out by two people called Syed Rizwan Farook and Tashfeen Malik, who had apparently “pledged allegiance” to ISIS/ISIL/Daesh on Facebook), Donald Trump has said that the USA must close its borders to all inbound Muslims, whether visiting tourists, working wage-earners, students or bona fide immigrants. He wants “a total and complete shutdown of Muslims entering the United States”. Presumably “total and complete” embraces diplomats, bureaucrats, politicians and kings. It’s hard to see how the United Nations in New York City could function adequately without the free movement of world envoys, legitimate mediators and other representatives of the Islamic world(s). Nor is it clear how Congress would enact such a ban: if it be unconstitutional to bar anyone from holding public office on the grounds of religious belief, by what philosophical rationale may they be barred from entry by virtue of their adherence to a particular religion? That aside, Donald Trump’s demand for a blanket ban on all Muslims of all denominations –both belligerent Wahhabi and benign Sufi – has been met with demands for Home Secretary Theresa May to ban him from visiting the UK. And that cry is going up from some prominent Conservatives. “I don’t believe he should be allowed to come anywhere near these shores,” says LBC’s Iain Dale. “If we can ban hate preachers, we can ban Donald Trump.” It’s a popular, now almost universal sentiment: if someone articulates ‘hate’, ban them. It is all redolent of the 2009 decision by then Home Secretary Jacqui Smith to ban the Dutch politician Geert Wilders from visiting the UK, despite having committed no crime, and despite having been invited by two members of the House of Lords. He was a democratically-elected citizen of the European Union, and thereby entitled – as are all citizens of the EU – to free movement within and across member states. He had broken no law in the Netherlands, in the UK, or even in the EU. He had simply made a film which was critical of aspects of Islamic Jihadism, and for that, he was deprived of his rights as a citizen of the EU. The UK government refused him entry because his views were considered to “threaten community harmony and therefore public security”. They invoked Article 19 of the 2006 Immigration Regulations, which permit the Home Office to ban a person from the UK “if his exclusion is justified on grounds of public policy, public security or public health”. So, for fear of civil unrest, liberty is diminished. By way of explanation for the ban, the Home Office said it “opposes extremism in all its forms” and would work to “stop those who want to spread extremism, hatred and violent messages in our communities from coming to our country”. Is it extremist to oppose extremism? Is it extremist to defend freedom, demand justice or uphold liberty? And what if Donald Trump wins the GOP nomination? And what then if he should win the Presidency? Are we really entertaining the political possibility of barring the President of the United States and leader of the free world from visiting the United Kingdom? If so, why stop there? Aren’t a few other world leaders caught up in ‘extremism’ or embroiled in expressions of ‘hate’? One wonders if those who demand that Trump be barred from entering the UK would advocate a ban on the sale of the Qur’an? One wonders if they’ve even read it (and understood it)? Isn’t it rather more important, not to say imperative, to support the freedoms of speech and expression? Isn’t it rather more vital to demonstrate to the likes of Donald Trump that the impetus to bar all Muslims from entry to your country is morally no different from cleansing your country of all Christians and Jews? Subversion, heresy, hate and apostasy are variously apprehended. One man’s evil extremist is another man’s righteous prophet. If we ban Donald Trump for his religious illiteracy, political incapacity and human insensitivity, we deny freedom of speech and limit freedom of religion and so curtail participation in public debate. As Lord Justice Sedley said in 1999, “Free speech includes not only the offensive, but the irritating, the contentious, the eccentric, the heretical, the unwelcome and the provocative, providing it does not tend to provoke violence.” If we may not applaud or heckle Donald Trump, then we move ever-closer toward the day when we may not criticise Islam, question the Qur’an or defame Mohammed, for to do so would be an unacceptable expression of ‘hate’, which blasphemy imperils the peace and security of the Realm.